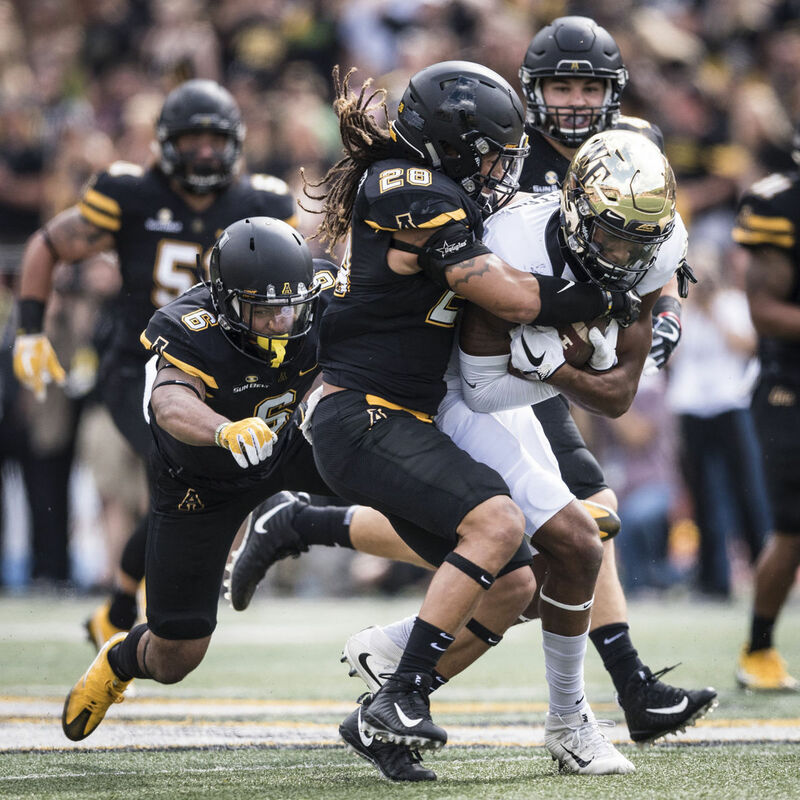 BOONE, N.C. — A week ago, at Texas State, Appalachian State executed well enough on the final play of the game to escape with a 20-13 win. But the lack of precision in the final seconds on Saturday cost the Mountaineers dearly as Wake Forest’s 6-foot-5 Scotty Washington leaped and blocked Michael Rubino’s 44-yard field goal attempt with five seconds left to hang on for its 20-19 victory before a record crowd of 35,126 disappointed fans at Kidd Brewer Stadium. ASU (2-2) dominated the Demon Deacons (4-0) statistically, piling up a 494-344 advantage in total yards as the Mountaineer passing attack, behind quarterback Taylor Lamb (26-of-50 and two TDs passing) rolled to 372 passing yards and the defense stymied the high-powered Wake Forest offense. It was on special teams, however, where the Mountaineers were found lacking. Among the missed opportunities were a blocked extra point after Lamb’s flea-flicker, 20-yard touchdown strike to tight end Levi Dufield in the first quarter, the messed-up timing that led to Rubino’s 35-yard kick at the end of the first half sailing wide left and the blocked kick at the bitter end. A decade removed from its last win over a Power-5 conference team, App State had a chance to end that streak when Rubino lined up from 44 yards out on fourth and five from the Deacon 27. He responded by drilling his kick wide left again, but the play was blown dead on Wake Forest’s offsides penalty that moved the ball to the 22. With a shorter kick needed to lift Appalachian to the win, Washington got enough penetration through a gap in the line and his well-timed jump allowed him to block the low, line drive off Rubino’s right foot. Ten years earlier, a clutch field goal by Julian Rauch and Corey Lynch’s dramatic block of Jason Gingell’s final-play kick had secured Appalachian’s last Power-5 victory, the stunning 34-32 win over Michigan. But this time the roles were flip-flopped. After Wake Forest struck for a field goal with its jet-tempo on the opening drive, App State scored twice in the remainder of the first half to take a 9-3 advantage. It was the first of six lead changes in this typically tight regional matchup that was being played for the first time since 2001 and for the initial meeting in Boone. But the Mountaineers lost some precious momentum when Rubino hooked his second field goal attempt. A nine-play, 97-yard drive put the Deacons on top at 10-9 midway through the third period when quarterback John Wolford (14-of-27 for 176 yards and two TDs passing, 13 carries for yards rushing) connected with Greg Dortsch for the 10-yard scoring aerial. It took Appalachian less than a minute to strike back as T.J. Watkins turned a jet sweep toss from Lamb into an 84-yard touchdown that pushed the Mountaineers back ahead 16-10. Wake Forest responded with another impressive march, going 75 yards in 10 plays to retake the lead on a six-yard, play action pass from Wolford to Cam Serine. The teams traded the lead twice more on field goals by Rubino and Mike Weaver to set up the final, wild three minutes. Appalachian needed to use its three second-half timeouts as it held Wake Forest to a three and out and got the ball back at its own 46 with 1:42 remaining. Facing a fourth and 15 moments later, freshman receiver Thomas Hennigan drew a pass interference call to keep Mountaineer hopes alive and move the ball to the Deacon 44. Three Lamb completions later, ASU was within field goal range. But Washington’s block saved the game for Wake Forest. While Wake Forest left excited, it was another bitter disappointment for the Mountaineers, who also lost another Power-5 opportunity at Tennessee — largely due to kicking issues — last year. The Mountaineers have a week off before returning to action for homecoming on Oct. 7 in a Sun Belt Conference game at 3:30 p.m. against New Mexico State.